Is It Wrong to Keep Exotic Animals as Pets? Other girls coveted ponies. When I was very young, I really wanted a squirrel monkey. My mother’s family had kept several of them in Cuba, where she grew up. Stories of her homeland’s simian brood made me long for a monkey to call my own. Mercifully, my parents never gave in. In Cuba, the critters had free-range on a farm, interacting with their own in conditions that, while not ideal, were adequately suited to provide conspecific community, mental stimulation and plenty of forage. I shudder to think what fate might have befallen their Miami cousins. How can anyone possibly meet their complex mix of needs in a suburban environment? But that doesn’t keep the shop down the street from me from selling them. “Monkeys! Monkeys! Monkeys!” the store's window stickers proudly proclaim in gaudy neon green. And it’s not just monkeys. Sure, their smarts are such that we tend to worry more for their welfare than we do for other animals, but how are monkey needs any more complex than, say, an African gray parrot? Is their welfare fundamentally any more important than a tortoise or a Chinese fighting fish? You could argue that lines should be drawn between birds, reptiles, fish and mammals — and I won't hotly debate that here. I will, however, stake my claim on the notion that we are almost always doing a disservice to exotic animals when we keep them as pets, even when they’re bred in captivity and have no idea what they’re missing. Disney’s zoo veterinarian dished on this incendiary topic last month at the North American Veterinary Conference during a lecture titled "Should These Things Really Be Pets After All?" He argued that exotic animals don't tend to make good pets, and that it might be immoral to keep them as such. Nothing good can come from keeping an animal bereft of its natural habitat, along with the opportunity to engage in the wide spectrum of its natural behaviors. You may think it's a funny thing for a zoo veterinarian to argue, but many zoo vets believe that opportunities for human education and captive breeding inherently exempt their places of employment. They believe that the rules set up to protect exotic animals from living potentially unhappy lives as pets apply to those who'd unwittingly (or not) put themselves, other humans and the environment in harm's way — but not the professionals who are trying hard to save them. Sure, they’ll concede that some people might be capable of giving a blue-and-gold macaw an amazingly enriched forever home, but how many more are effectively tortured behind bars for the bored eternity of their lengthy lifespans? Or released into the wild, where they’ll either die or impact the environment adversely? At least in zoos they’re cared for by experts, serve as ambassadors for their species and help propagate more of their kind for the good of their own species. In case you’re wondering, it’s not just zoo veterinarians who feel this way. Animal welfare organizations, like the American Society for the Prevention of Cruelty to Animals and the Humane Society of the United States, readily agree, citing the risks to human health and safety, animal welfare and the environment. What’s more, the American Veterinary Medical Association, the United States Department of Agriculture and the Centers for Disease Control and Prevention have all opposed the idea of keeping select exotic animals as pets. 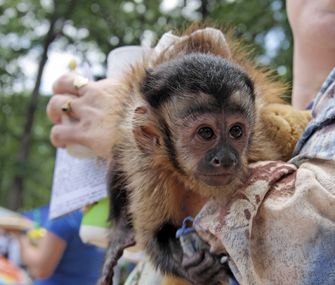 For example, the AVMA stands in staunch opposition to keeping primates as pets. Not everyone agrees, of course, referencing the limited cognition of some of these animals: “Snakes don’t need much stimulation, do they?” Given the wide variety of exotic species, there’s certainly room for a variety of opinions here. As in, there’s a very big difference between keeping a parakeet and a panther. Nonetheless, some of us still believe that when it comes to their welfare, there are more similarities even between these two very different species than there are differences when it comes to keeping them safe, comfortable, well kept and contained.